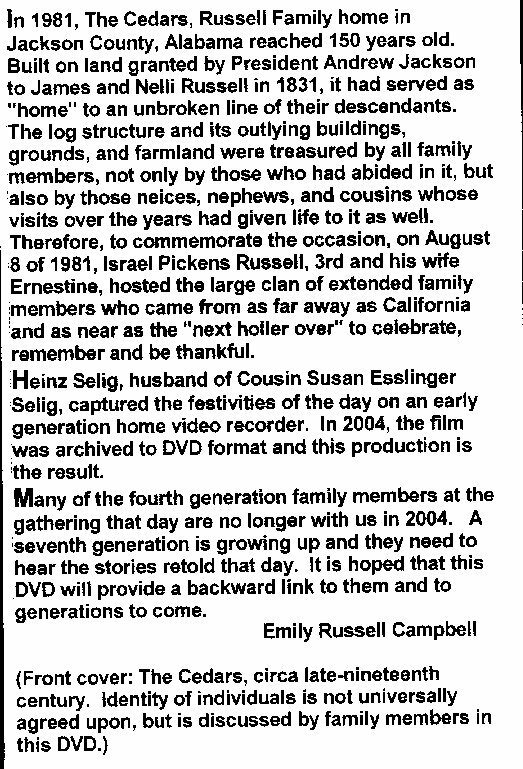 HISTORY OF "THE ISRAEL PICKENS RUSSELL FAMILY of JACKSON COUNTY, ALABAMA"
HISTORY OF "MY HOME IN ALABAMA"
The original one-story Victorian-Cottage-Style home was built in 1897, mostly by workers on the Russell farm, under the careful supervision of my grandfather, I.P. Russell, Jr., for his bride-to-be, my grandmother, Katharine Rebecca Sanders, daughter of the Rev. C. B. Sanders and Anna Duanna White Sanders. The couple, wed November 16,1898 ,celebrated their Golden Wedding Anniversary in 1948. Their two sons, Sanders and Pickens, and only daughter, Helen, my mother, were born in this house. The original Golden-Oak Mantelpiece and Pocket-Doors in the Parlor, Beveled-Glass Front Door, Golden-Oak Main Stairway, doors, windows, transoms, and detailed woodwork were shipped into nearby Stevenson, Alabama by rail. The present green-shuttered home with Hip Roof, has four downstairs rooms with 12-foot ceilings and picture-railings, a Country Kitchen, and Foyer. It features a Veranda Front Porch with Railing, Greek-Revival-Style columns, and a bead-board ceiling. The stone and brick foundation and retaining wall, as well as much of the Pine tongue-and-groove flooring, weather-boarding, Cedar shakes, and lattice-work, were hand-crafted from materials available on the Russell Farm. Eldest son, Sanders Russell,won the 1962 Hambletonian, among other notable successes. He was inducted into the Alabama Sportsman Hall of Fame at Birmingham, AL . He was inducted into the US Harness Racing Living Hall of Fame in Goshen, New York in 1970. Upon the deaths of my grandparents in the 1950's, the house was deeded to my mother, Helen Russell Phillips, who in turn deeded it to me upon her death. The house is celebrating more than 100 years owned and lived in by succeeding generations of the Russell and Phillips families. As friends and family members drop by the Front Porch, sit in the original Front Porch Swing, which replaced my grandfather's beloved Hammock, and have a glass of Pink Lemonade; they escape the sounds of the city, share the gentle breeze, and listen to the untouched sounds of nature, as the Israel Pickens Russell, Jr. Home, "MY HOME IN ALABAMA", enters the 21st Century. A Family of Musicians and Animal Lovers! Music and Animals are important to the Russell and Phillips family life. My grandmother owned and played a beautiful Chickering Square Single-String Piano which occupied most of the Living Room at the House. My grandfather played Trumpet in the first Band of Stevenson, which was organized and conducted by his cousin,a descendant of Lorenzo Russell, who taught Music at the "Emma Austin Academy", in Stevenson. Most Russell family members have excellent singing voices. My grandfather's sister, Blanche Russell Esslinger, had a son, Russell Esslinger, and a daughter, Nell Esslinger, who were members of the cast of a Broadway Production in the 1920s called, "Blossom Time". Sanders Russell was a talented ballroom dancer and music lover. My mother, father, and their three children sang in the Choir of the First Methodist Church of Stevenson. Harold Russell Phillips and I are presently choir members at The First United Methodist Church of Stevenson, and Frances P. Crownover, is the current Church Pianist. I directed The Stevenson High School Band for two years, as a young faculty member in the 1960s. I also played Piano and Organ in the church, school, and community for over 40 years, as well as teaching private piano and voice lessons for more than a decade. Frances and I played Clarinet in the Stevenson High School Band. Our brother, Harold Russell Phillips, played Trumpet and Baritone Horn in the Band, as did his son, Russ. His daughter, Karen, played the piano, and conducted The Stevenson High School Marching Band as a Drum Majorette. She also played Flute in the Stevenson High School Concert Band. Sanders and Evelyn's younger son, the late Henry Bosworth Russell, earned a doctorate at Northwestern University in French and was an avid collector of vintage books, music, and movies. Henry was a French and Spanish professor, novel translator, published poet, and an accomplished pianist, as well. Their elder son, Walter S. Russell, a classical concert pianist, is also a talented cocktail pianist. Walter earned a doctorate in Music and the Humanities at Vanderbilt University and Emory University. He served on the staff of Georgia Tech and several other colleges, before becoming a prominent Harness Horse Racing Judge. Pickens ,III, and Ernestine Russell's older daughter, Mary Lucille Russell Allphin, a graduate of Auburn University and Emory University in Medical Technology, played Solo Trumpet in the Stevenson High School Band. Younger daughter, Emily Ann Russell Campbell, a graduate of Auburn University and The University of Kentucky, played Flute during Concert Season in The Stevenson High School Band. Emily, also a Drum Majorette, conducted the Stevenson High School Marching Band during Football Season. Emily, a Nutritionist, has been employed by The University of Kentucky, and is presently on the staff of Auburn University's Extension Department, in North Alabama. Son, Pickens Russell ,III bred, trained, and raced Harness Horses; Grandson, Walter, was a Harness Horse Racing Judge; Grandson, Henry, worked as a Groom as a high school and college student , as did Harold R. Phillips. Emily R. Campbell, daughter of Pickens, III, worked at the Red Mile Track at Lexington, KY and is a skilled saddle horse trainer today. Kathryn Phillips breeds, trains, and handles Champion AKC Chow Chows and Tibetan Spaniels under the Kennel names "The Gin-Chows" and "The Gin-Tai Tibetan Spaniels". Frances Crownover assists her in training and handling the Tibetan Spaniels. Both Frances and Kathryn hold Masters Degrees from The University of Alabama and are Career Educators. Frances' son, Jeremy Clay McKee, a Civil Engineer in Albertville and Huntsville, AL, is also a graduate of The University of Alabama. Clay played piano, sang and accompanied himself on guitar, as a hobby while in high school. Harold Russell's son, Russ, and daughter, Karen, graduates of Auburn University, worked as Veterinarian Assistants during their High School and College years. Russ is an Animal Surgeon and Veterinarian at Phillips Small Animal Clinic at Scottsboro, AL. Karen is employed by Children's Hospital in Birmingham, AL. Harold, a graduate of Auburn University, and wife, Ann, bred and trained Harness Horses in the family tradition here on the farm. Harold, a farmer and cattleman, was a long-time Board Member and President of the National Soy Bean Association. They own Cedar Hill Farms located on the original Land Grant Farm and use the original Barns and Race Track of Russell Stables. Thereby, keeping the Tradition Alive and Well ! ..is titled "Living History, Making History" and takes a human-interest approach to their sixty-eight years of marriage and Life at "The Cedars", while interweaving some of their personal accomplishments, little-known biographical data, and family history. Of special interest, to me, was Ernestine's memories of growing up in the town of Stevenson, the daughter of E.O. and Lucille Howe Mann. Her parents ran the "Stevenson Hotel" adjoining "The Stevenson Railway Museum" in "Historic Downtown" and its restaurant, a flourishing business until they sold it in 1937. Ernestine's parents and her two sisters, Sarah Mann Graham and Mary Mann Jones, took their meals at the hotel restaurant daily, which afforded a unique opportunity for making friends and sharing in Stevenson's community life. Their father later became the local Postmaster, also offering him and his family a special perspective on the lives of Stevenson's citizens, their families, and customs. On behalf of Mrs. Russell and her family, I thank you for coming today and for your kind expressions of love, support and sympathy to them. To the Reverend Stone, I thank you for sharing your pulpit this afternoon. To my friend Miss Ernestine, I am honored that you would ask me to say a few words on this occasion and I thank you for this privilege. Israel Pickens Russell the Third. When Mr. Pick slipped from this world last Thursday evening, a coal oil lamp burned at his bedside, electric power having been lost to the storms that ravaged our state the day before. On another April day ninety-six years ago, his parents welcomed him to the world, in another house nearby, on the same farm where he died this week. Another lamp burned beside that bed, too, on that spring day all those years ago. Between those two symbolic flames, separated by nearly a century, lies a most remarkable life of duty, family, friendship, faithfulness, fidelity. Israel Pickens Russell the Third. Holy Scripture teaches us that “a good name is rather to be chosen than great riches.…” 1 1 Proverbs 22:1 2 Alabama's third governor was a native of North Carolina, born on January 30, 1780. Pickens was considered a successful and able governor. "He was a man of exceptional capability, vision and compassion" (Stewart, p. 59). After hand-picking his successor for governor, Pickens was appointed to the US Senate to fill a vacancy created by the resignation of Dr. Henry Crawford. Pickens served a short time and retired to Cuba due to ill health where he died on April 24, 1827. Besides Pickens' political abilities he was active in the American Colonization Society, was interested in scientific research, and invented a lunar dial. [http://www.archives.state.al.us/govs_list/g_picken.html] Pickens Russell. It is a name that means much to many; that resonates through the histo- ry of our state; that will shine brightly for years to come, not just in the collective memory and love of his kith and kin, but indeed in the history of this place we call home. It is, to be sure, an aristocratic and patrician name, not unlike the man who carried it. His ancestor Judge James Russell named the first I. P. Russell at the request of his good friend, Ala- bama’s third governor, Israel Pickens,2 on the promise to “educate the boy if you name him after me.” Governor Pickens died before he could fulfill his promise, but the title endured. To those of us knew him, that storied name became “Mr. Pickens” or “Pick” or “Daddy” or “Grandpa” or “Gee-Paw” or “Uncle Pick.” Or, as I sometimes refer to the Russells in my best imitation of Mrs. Malaprop—“Aunt Pick and Uncle Stine.” The man of these familiar names—not the fancy name—is the man whom we’ve come to remember and mourn today. For the man who carried this legendary name—a name, interestingly enough that Pick himself thought was “wretched” and a burden and vowed he’d never pass along to another son, that there’d never be an “Israel Pickens Russell the FOURTH”—the man of these familiar titles of endearment, is the man who made this family what it is, the man who helped mold and shape this community, the man who left his mark on the harness racing world, the man who toiled in the Lord’s vineyard in this church, the man who spun the yesterday boys of this town into fine horsemen. He was a man to whom duty was more than an abstraction or nice concept, but was the pole star guiding his life. Duty for Pick meant commitment to family and farm. It meant first and foremost honor- ing his marriage vows to Ernestine Mann, now his bride of seventy years. It meant teaching his daughters by example to respect the dignity and worth of every person. It meant when the 1960’s brought racial integration to our schools, Pickens Russell didn’t rail against these inevita ble and right changes to the old order of things, but he said simply, “it is the right thing to do.” When Emily Ann—the hippy daughter—announced to her daddy, as they rode a jog cart together around Lexington’s Red Mile race course, that she was leaving home to join the Peace Corps and would be assigned to the Philippines, he said simply, “we hate to see you that far from home, but if that’s what you want to do, go.” When Mary Lucile—the straight-arrow daugh ter—married a military man (and a R-e-p-u-b-l-i-c-a-n to boot! ), moving to far-off California, Pick simply offered her unconditional love, support and blessing. After that wedding in this church, Pickens pulled aside Bob Allphin [All-fin] in the very room at the back of the church where visitation was held earlier this afternoon, and instructed Bob to “…make sure she writes a letter home to her mother every week.” Mary and Emily brought both their parents great satisfaction with the lives they have lived. Mary and Bob’s children and grandchildren have brought much joy to Pickens. Emily’s return to the farm in 1998 from Kentucky was a blessing to her parents, insuring that they re mained independent, enjoying life at home longer than many others of their generation. Duty for Pick meant choosing to remain behind and operate the farm while his famous older brother, Sanders Russell, was gone six-or-more months each year on the Grand Harness racing circuit, from New York to Kentucky to Pennsylvania to Michigan. Pick supported brother Sanders both at home and on the road, support culminating in a victory for Russell Stables at the prestigious Hambletonian Stakes in 1962. Half a century ago, harness racing’s crown jewel, its highest award, came home to the little hamlet of Stevenson, Alabama; it came home in a sulky driven by Sanders and cheered on by Pickens. Waiting at home for the brothers was their great est fan, their sister Helen Russell Phillips. Pickens loved Sanders without reservation, but he loved Helen—and she loved him—unabashedly. Pickens was there when Sanders was inducted into the Alabama Sports Hall of Fame— the only horseman so honored—and in the Harness Racing Hall of Fame. Later this summer, Sanders’ son—Pickens’ nephew—Judge Walter Russell will join his father as he is inducted into the Living Harness Racing Hall of Fame in Goshen, New York. Pickens enjoyed his own great success with Standardbred horses, too, training and racing “Fresh Yankee” in the late 1970's and early 1980's. She became the first trotting horse mare bred in the United States to win in excess of a million dollars As long as there are trotters and pacers, the name “Russell Stables” will be there in the harness racing pantheon of stars. Descended from a pioneer Tennessee Valley family, Israel Pickens Russell the Third became his generation’s patriarch. This duty he acquitted well, leading by example on the fami ly’s Century and Heritage farm3, granted to Pickens’ ancestor in 1830. The letters patent signed by President Andrew Jackson hang to this good day on the wall of The Cedars, the farmhouse that is the Russell ancestral home, where Pickens and Ernestine have lived since 1947 and where he died. He was patriarch not just to his own family and kinfolk, but also to the numerous other families who lived and worked on the farm through the years. He raised cattle and hogs, trained horses, planted corn, cotton and soybeans, baled hay, saved scrap lumber and metal to be used on some as yet un-thought-of project or another, maintained the equipment and buildings and kept the track pristinely harrowed. His stewardship made it a model farm. In doing so, he made a living for his own family and employed men who, in turn, earned a livelihood for their families. Just as important, however, were the lessons in good farm practice and in life itself that he taught. Lessons he taught by example, in his work ethic, his responsibility, his reverence for the earth and for its limited resources. He will be remembered by the farm families for years to come as a kind, wise and good man. 3 This program is administered by the Alabama Department of Agriculture and Industries to recognize and honor those farms that have been in operation as a family farm over a long period of time and have played a significant role in Alabama history. A Century Farm is one that has been in the same family continuously for at least 100 years and currently has some agricultural activities on the farm. The farm must include at least forty acres of land and be owned by the applicant or nominee. A Heritage Farm is one that has been operated continuously as a family farm for at least 100 years. The farm must possess interesting and important historical and agricultural aspects, including one or more structures at least forty years old. The farm must be at least forty acres of land owned and operated by the applicant, who must reside in Alabama. Had Pickens Russell stayed on the farm and let church and community run themselves, no one would have blamed him or questioned his motives. But this he did not do. 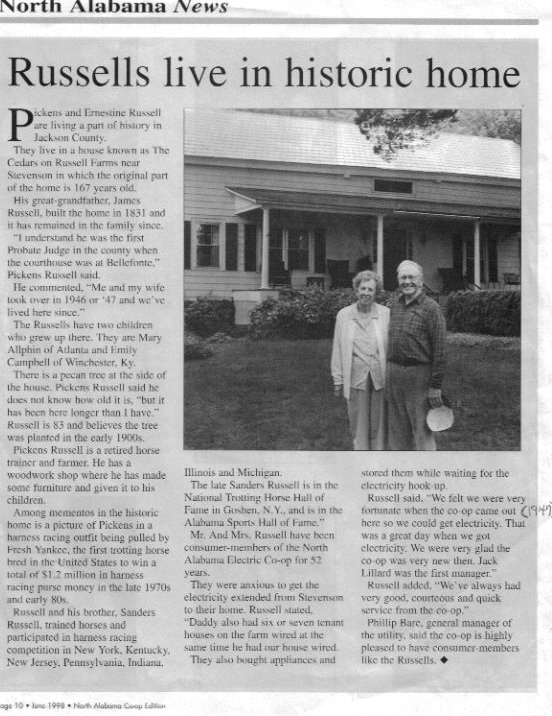 Over sixty or more years, he and Mrs. Russell have been involved in practically every positive thing in this community. In addition to the Stevenson High School Band Boosters and P.T.A. and all the other usual father-daughter activities, he was an original member of the Jackson County Hospital Board, which built Jackson County Hospital (now Highlands Medical Center) and North Jackson Hospital, which served the people of Stevenson and Bridgeport. He chaired the Hospital Board when Jackson County Nursing Home was built. He was a founding member of the Stevenson Park Board, which gave us one of the most beautiful small town public parks in the state. He was an early member of the Stevenson Railroad Depot Museum Board of Trustees, which saved our 1872 National Register of Historic Places train station and developed it into a museum of local history. And, though he had no sons of his own, he unselfishly was a member of the Sequatchie Valley Council of the Boy Scouts of America. In 1948, he was a charter member of the Steven son Civic Club and was Stevenson’s Man of the Year in 1970. In 2001, he and Ernestine were given Stevenson’s highest honor and named Grand Marshals of the Stevenson Depot Days Fes tival parade. For 44 years, he was a Director of the First National Bank of Stevenson, now known as First Southern State Bank. As a lifelong member of First United Methodist Church of Stevenson, he served as its Chairman of the Board, Chairman of Finance, and Chairman of Trustees. Perhaps his greatest example of servant leadership came every Sunday, when he quietly occupied a pew in this church with his wife and his daughters. Pickens was the quintessential Southern gentleman planter farmer. When you get home today, look up “noblesse oblige” in Webster’s—or “Google it” for those of you don’t have dic tionaries!—and see if his picture isn’t there—if it’s not, please sketch it in for me. The day after my own father was buried, after the crowds had gone home, a knock came on the door. It was Pickens. “I just came to check on you and to tell you how sorry I am about John. He was a good friend and a fine man.” He stayed a few minutes. After he left, someone asked, “Why was he here?” I answered, “Because that’s what a gentleman does.” Though more than 27 years have passed from that day until this, it is a few minutes’ visit, just a small kindness, that I remember and treasure. Over the past couple of years, I occasionally visited Mr. Pick, as did many others. All of us left amazed at his memory, his recall for fact and detail, his awareness of local, state and na tional events. We discussed politics almost every time I visited and, I’m proud to say, we saw it eye-to-eye. My daughter Rachael and I called on the Russells just three weeks ago and his worry that day was the tone and nature of our current national discourse. We agreed that politics had become unfriendly, ungentlemanly and we lamented this unfortunate state of affairs. During retirement, Pick made beautiful furniture for family members, tended the grounds of his antebellum home and consulted on horse and farm questions. He admired so much the hard work and dedication to duty of his nephew and farming partner, Harold Russell Phillips. Harold’s scientific knowledge of agriculture, learned at the finest university in the world, blended with Pickens’ hands-on knowledge of the tried-and-true ways, made the family business more successful than ever. Pickens thrived on whatever was happening on the farm and reveled in the activities of his extended family. Those two young men, Harold’s grandsons—the seventh generation of this family to reside on the farm and who live in brother Sanders’ house—brought him much joy. He was a genuine friend to his friends. A true husband to his wife. A loving father to his children and grandchildren. Along with all the rest of it, this shall stand as his legacy. With these simple, everyday acts, Israel Pickens Russell the Third preached his own funeral. Last Thursday, ninety-six years after he entered this world and eleven years into the Twenty-First Century, he died in a room lit by lamp light, just as it was in the beginning. I drove out from Stevenson to The Cedars after hearing the news of his death. Along the way, I saw be side the little crooked bridge a twisted and broken ancient, scaly-bark hickory nut tree—the true one that was faithful and always bore nuts, even when the others did not—bent over to the ground the day before by nature’s awesome fury. Russell Mountain rose before me, soaring in its full spring mantle of green leaf; majestic, backlit by a glorious sunset in shades of blazing orange and clear, brilliant blue. It was the gloaming, that beautiful time which must come to every day, at its end; the time when day turns to evening and evening then turns to night. But we know, we believe that just beyond the night is morning and that “joy cometh in the morning.”4 4 “…Weeping may endure for a night, but joy [cometh] in the morning.” Psalms 30:5 5 "The Gate of the Year" is the popular name given to a poem by Minnie Louise Haskins. The title given to it by the author was "God Knows". She studied and then taught at the London School of Economics in the first half of the twentieth century. Published in 1908, it was part of a collection titled The Desert. It caught the public attention and the popular imagination, when Queen Elizabeth handed a copy to her husband, King George VI, and he quoted it in his 1939 Christmas broadcast to the British Empire. The poem was widely acclaimed as inspirational, reach- ing its first mass audience in the early days of the Second World War. Its words remained a source of comfort to the Queen for the rest of her life, and she had its words engraved on brass plaques and fixed to the gates of the King George VI Memorial Chapel at Windsor Castle, where the King was interred. Queen Elizabeth was also buried here in 2002, and the words of "The Gate of the Year" were read out at her state funeral. The poem was included in the closing moments of the 1940 Metro-Goldwyn-Mayer/Frank Borzage film The Mortal Storm, starring Margaret Sulla- van, Jimmy Stewart, Robert Young. The poet wrote these words: And I said to the man who stood at the gate of the year: “Give me a light that I may tread safely into the unknown.” And he replied: “Go out into the darkness and put your hand into the Hand of God. That shall be to you better than light and safer than a known way.” So I went forth, and finding the Hand of God, trod gladly into the night. And He led me towards the hills and the breaking of day in the lone East.5 God Knows And I said to the man who stood at the gate of the year: “Give me a light that I may tread safely into the unknown.” And he replied: “Go out into the darkness and put your hand into the Hand of God. That shall be to you better than light and safer than a known way.” So I went forth, and finding the Hand of God, trod gladly into the night. And He led me towards the hills and the breaking of day in the lone East. So heart bestill: What need our little life Our human life to know, If God hath comprehension? In all the dizzy strife Of things both high and low, God hideth His intention. God knows. His will Is best. The stretch of years Which wind ahead, so dim To our imperfect vision, Are clear to God. Our fears Are premature; In Him, All time hath full provision. Then rest: until God moves to lift the veil From our impatient eyes, When, as the sweeter features Of Life’s stern face we hail, Fair beyond all surmise God’s thought around His creatures Our mind shall fill. Amen. EULOGY Published by "THE USTA"